7 Nights from £629 inc Flights, Hotel & VIP Transfers - £315 OFF! 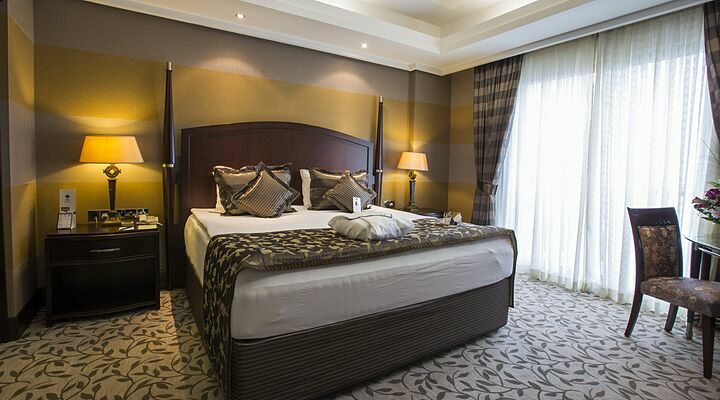 One of the first and finest five star hotels in Nicosia, the Merit Lefkosa Hotel offers top class accommodation within walking distance of the old walled city. Enjoy superb views across the city from the 14th floor restaurant. 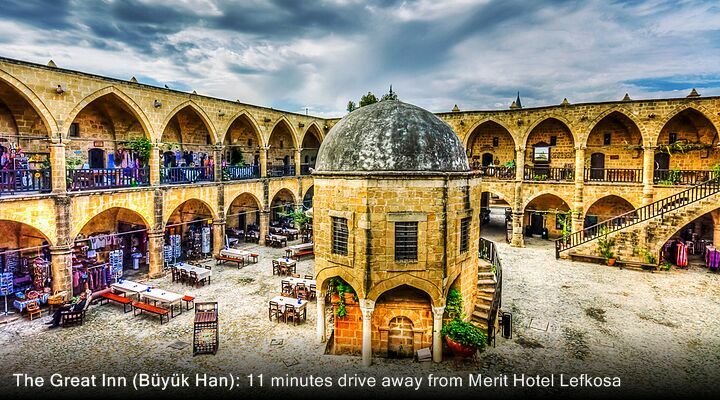 With its signature blend of Ottoman and Byzantine architecture, the Merit Lefkosa Hotel stands tall above the houses in the central Kumsal district of North Nicosia (Lefkosa in Turkish). 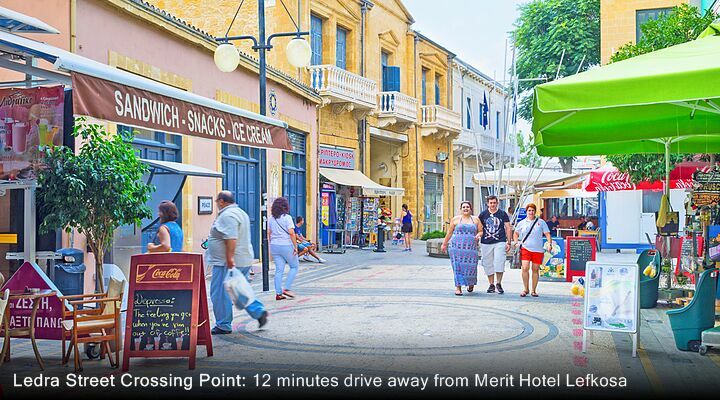 The Merit Lefkosa Hotel is an ideal base for a city break or longer stay in the last divided capital city in Europe , with easy access to all the city sights. 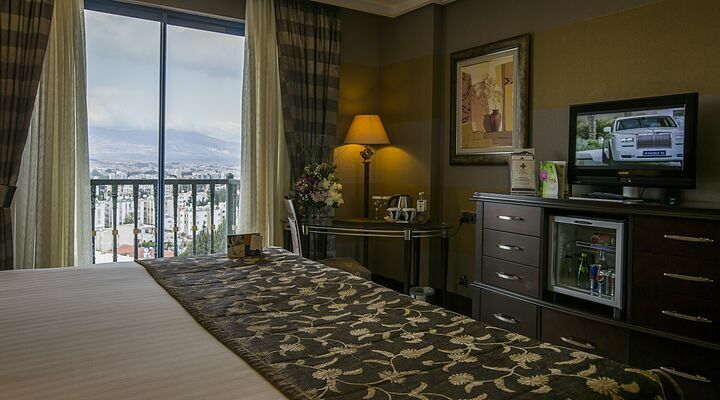 Book one of the upper floor bedrooms for amazing views across the city, to the mountains in the north and into south Cyprus. 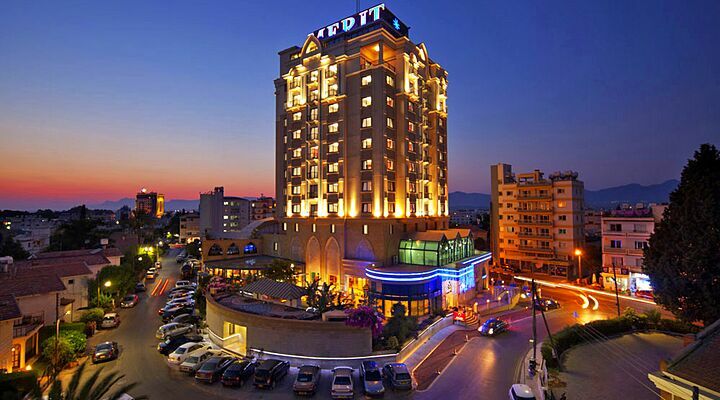 Get an instant quote for city breaks at the Merit Lefkosa Hotel - just fill in your details on the right! Or call our expert team on 0800 612 6600 - we're open seven days a week. 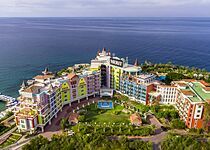 The Merit Lefkosa Hotel is primarily a business-orientated hotel, so as a tourist, you can enjoy the uncrowded facilities and amenities during the day. 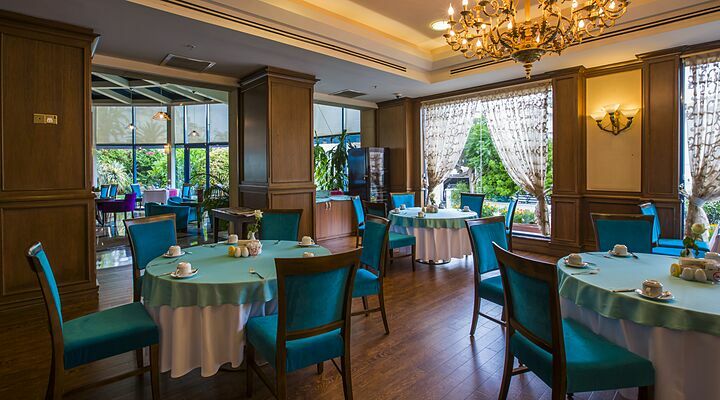 Enjoy a leisurely breakfast in the main restaurant with panoramic views and plan your day at leisure. 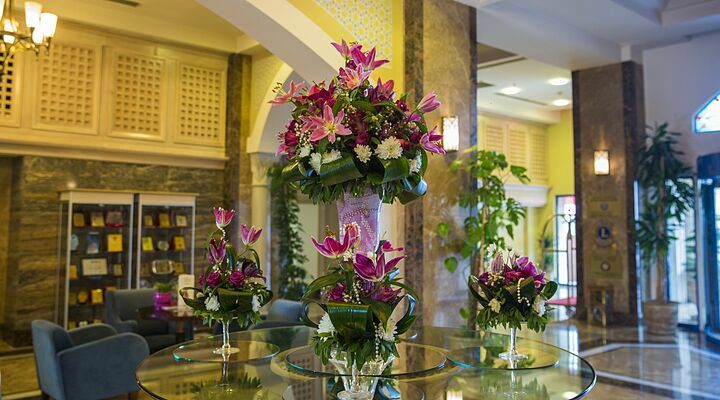 Stroll the city streets, then return for a relaxing drink in the Sultan Garden, or some serious pampering in the hotel's impressive spa. 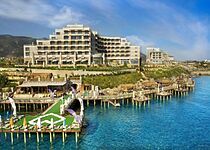 In the evening, the hotel is humming with people enjoying dinner, relaxing with colleagues and friends, or trying their luck in the glittering hotel casino, the largest in North Cyprus. The outside swimming pool at the Merit Lefkosa Hotel is delightful, set into natural wooden decking and surrounded by arches and planting, for a private and relaxing swim in the city. With a separate spa pool and plenty of sun loungers and seating, and comfy giant cushions on the deck, you can happily spend all day here, sustained by drinks and snacks from the bar. 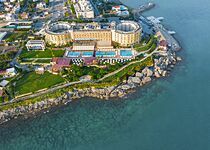 The spa at the Merit Lefkosa Hotel really is five star, with dry and wet saunas, a biosauna, steam room, adventure shower, two traditional Turkish baths (hamman), heated stone beds, and the amazing snow fountain, the ultimate 'cool' spa feature! Soothe away tired 'city legs' with a relaxing Thai, Bali or hot stone massage in a private room, complete with hot tub, or refresh your body and mind with specialist Aquamondie skin and body treatments. The fitness room has city views through full height glass windows and state of the art gym equipment including treadmills, bikes and weights, to keep you in trim. There are evening yoga classes twice a week. 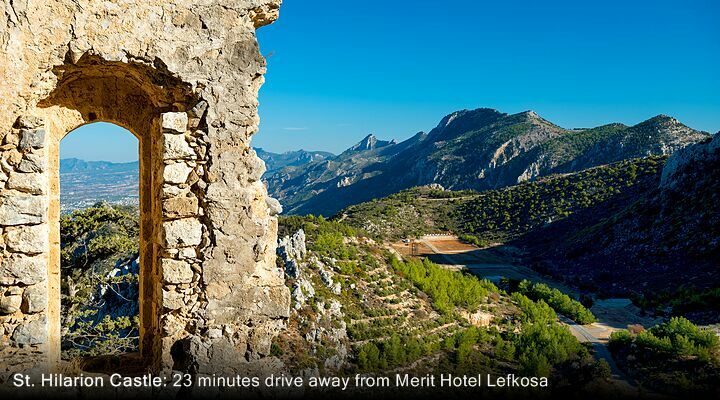 Choose a room with a view at the Merit Lefkosa Hotel, and you'll see for miles across the city from your private balcony. 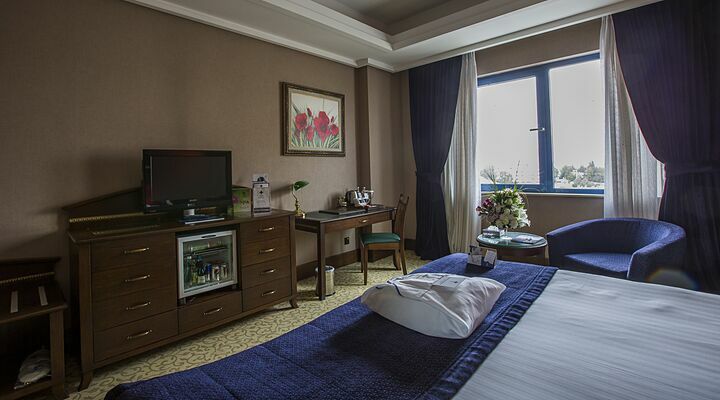 Each room at the Merit Lefkosa Hotel is well appointed as you'd expect for a five star hotel in this capital city, with central air conditioning, complimentary tea and coffee, minibar, satellite TV, and in-room safe. 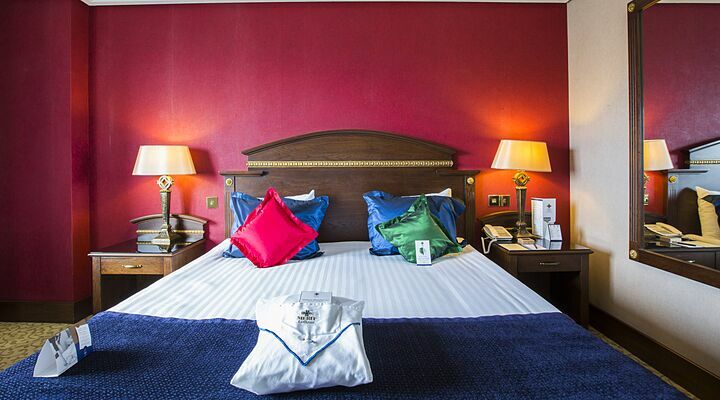 The en-suite bathrooms feel very luxurious, with classic blue tiles, granite countertops and opulent gold plated taps. Choose the perfect pillow for you from the pillow menu, keep in touch with your social media via free wifi internet, and leave your laundry to be done while you explore the city. There’s no bulky key to carry about either as the hotel had a keycard system. With the entire 5th floor consisting of non-smoking room, plus fully accessible rooms, adjoining rooms for families, and luxurious suites available, you can choose the room that exactly meets your needs. 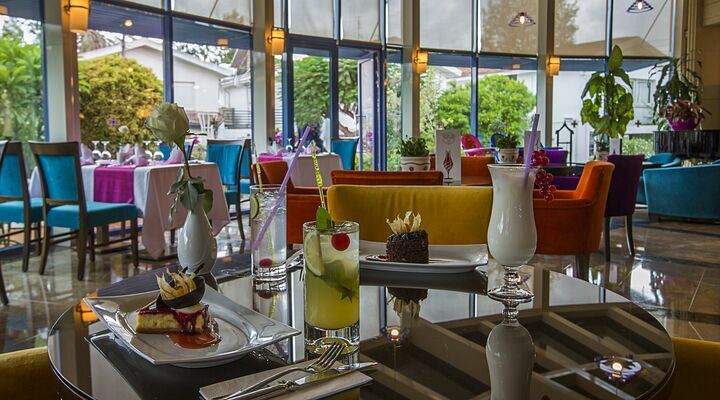 The Merit Lefkosa Hotel restaurants make dining a pleasure, thanks to a combination of willing staff and varied food choices. Enjoy an open buffet breakfast with tasty hot dishes and favourite cereals. Go a la carte for lunch and dinner in the main restaurant. 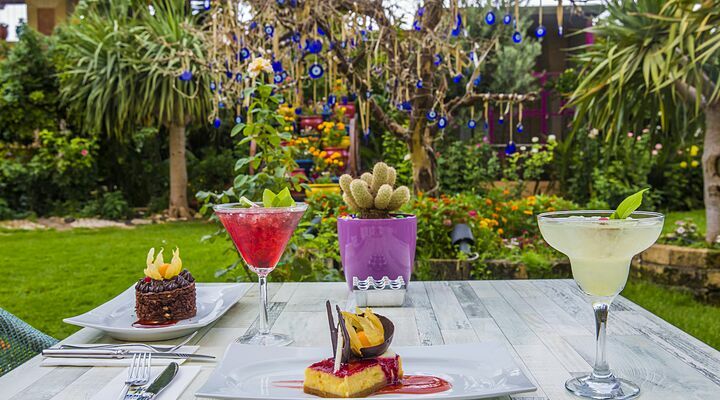 Enjoy the peaceful atmosphere in the Sultan restaurant in a pretty enclosed walled garden with lush planting and playful fountains. Take afternoon tea in the Merit café, then enjoy a pre-dinner drink in the lobby bar. For a classic taste of Turkey, head for the Panoramic Ottoman Kebab House, serving classic grilled kebabs with a selection of tasty meze and an amazing view over the twinkling lights of the city. 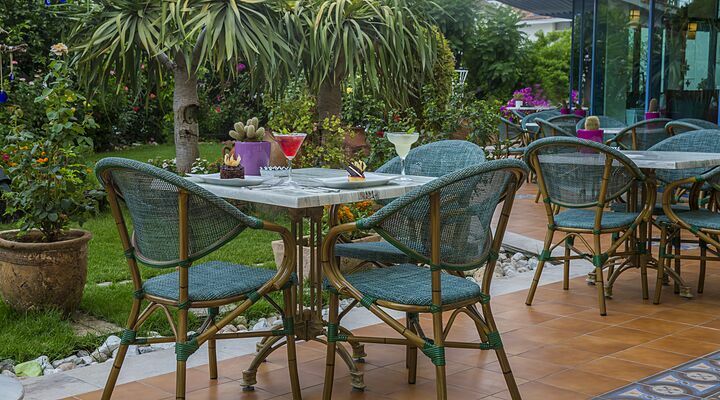 If you prefer to try local restaurants, there are dozens within walking distance of the hotel front door. 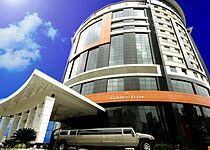 Transfers from Ercan International Airport to North Nicosia take just 20 minutes. So, with a flight to North Cyprus, you could go from plane steps to poolside in well under 60 minutes, giving you more time to enjoy this fascinating city.